This morning may have been one of my favorite commute days in years. One, because the snow was gorgeous and made for a very scenic ride, but two, because I met Jasper. 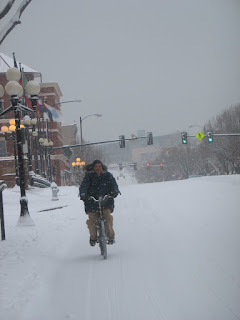 I pulled up next to Jasper and cheered "Yipee for snow and bicycles", he enthusiastically responded with "I love it, I feel so alive"! 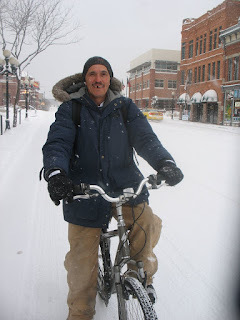 He loved being on his bicycle and REALLY loved being in the snow on his bicycle! It was great to meet someone that shared my enthusiasm. Jasper has been riding everyday for 5 years. He is most likely one of the mystery tracks that I see when it snows. I felt like I discovered a long lost brother that I had been seeking for 2.5 years! Thanks for making my day Jasper!